This all began poorly at The Cheeseboard. Despite their expertise with web design, their in-store efficiency left something to be desired. That being said we were there on a Saturday afternoon and they do have an amazing array of cheeses. When our card was finally called (after a mere 45 minutes) the cheesemonger was very knowledgeable. In fact – the Affidelice was her suggested addition to the booze-soaked cheese fest. It was a $17 for half a wheel. 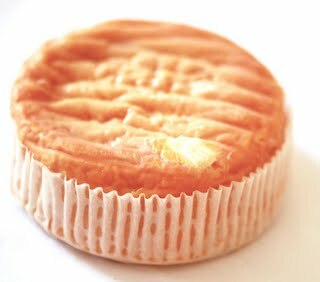 The AOC version is Epoisses de Bourgogne. Ours came from Robert Berthaut which we later found out is sanctioned by Jenkins along with Ami du Chambertin. He suggests avoiding Auxon , Renard, and Lincet. I was stunned by this cheese. We began this fromage adventure many years ago and every cheese has been enjoyable. The Affidelice, however, is on another level. I found it well balanced in every way. The first thing of note is the smell – bordering on blue and stinky but not as noxious. The color is almost like hay. The next thing is the consistency – rather creamy with just the right texture. And the taste…The taste is out of this world. Each taste is a like a voyage of flavors: at first nutty, buttery, and slightly bitter with a spice that hits at the end. Every bite left me wanting more. It’s not surprising that Jenkins describes it as “majestic” and lists it as one of his favorite cheeses in the world. Thanks for the excellent posts, Chedda and Gouda. I have seen an Affidelice several times at cheese shops but have never tried it-- you have whetted my palate enough and I will get some. I will aim for the Amu du Chambertin as suggested. I find it very entertaining that Jenkins describes this cheese as "Majestic" as it conjurs up such glorious images of royal grandeur and gastronmic gluttony. Such us the story with some of the world's finest foods. I'm glad you guys also appreciated the mild but creamy Chimay.